April 23, 2018--Finished this lovely rozashi project into an ornament. For the most part, I'm pleased with how it turned out. 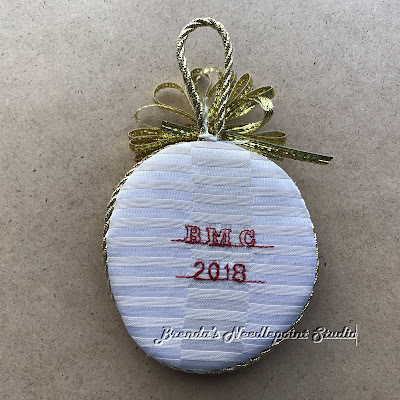 I kept the shape of the ornament as it was drawn on the "ro" canvas by the designer, Margaret Kinsey, but if I had to do it all over again, I would have redrawn the shape as a proper circle. As it is, it looks a little out of kilter, but not the end of the world. 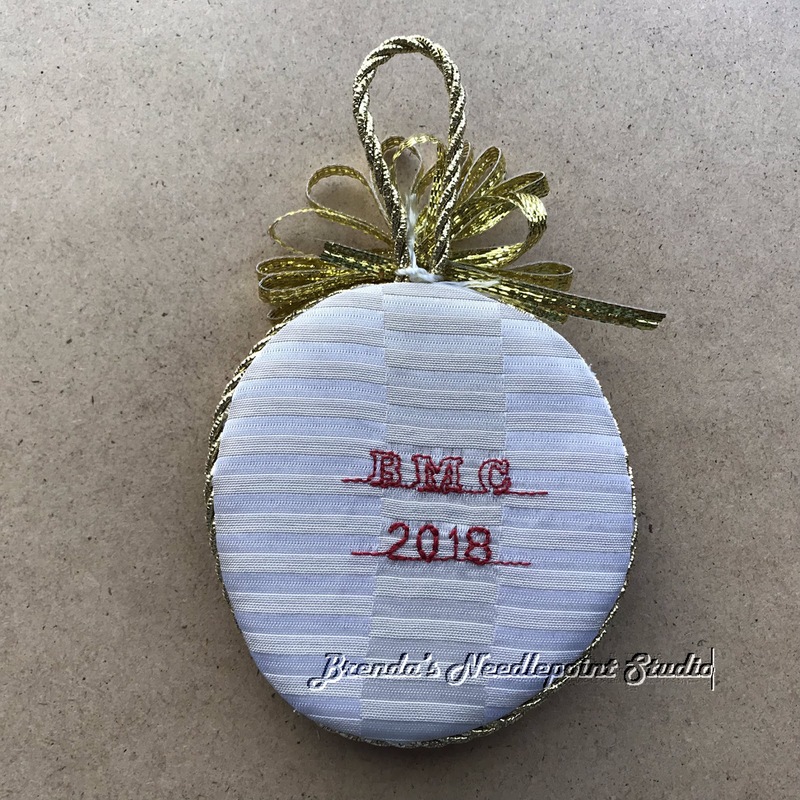 The bow on the top of the ornament was made with a special ribbon I found online. The ribbon is about 1/8" wide with a string running through it. 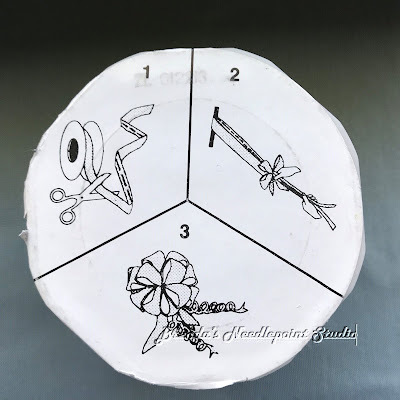 To make a bow, all you need do is pull the string to make as many loops in the ribbon you would like. Cut, secure, and voila--done. I now want to find this in all the colors I use a lot of. This is what the ribbon looks like with string running through it. February 11, 2018--After stitching Margaret Kinsey's Imari Sampler and Baby Iris Rozashi projects, I just had to stitch another. Found this delightful ornament in the September/October 2005 Needlepoint Now Magazine and just had to stitch it--but first, to find the "ro" canvas. I learned that Margaret Kinsey is the only US distributor of this canvas, so I emailed her letting her know I wanted to purchase some ro for the ornament project she designed for the magazine. Well, she wrote to let me know she had a pre-made up kit and would I like to purchase it. Yes, yes--the kit not only included the line drawing on ro, but it was already mounted on the special frame and included the sumptuous silk threads used in rozashi. Happy dance. Once the kit arrived, I dropped everything and got working on it. 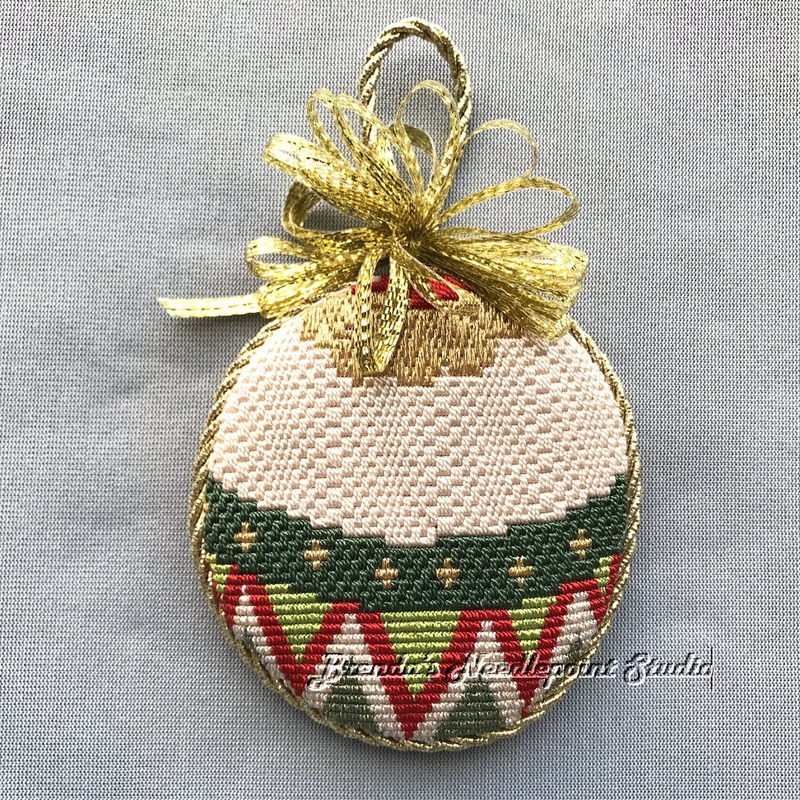 It was so easy to do, and now that it's stitched, need to get this, and the other two rozashi projects, made into hanging ornaments. 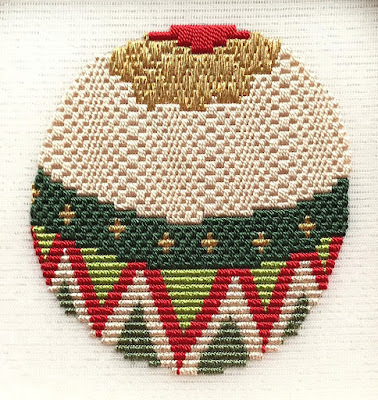 I did learn something while stitching this piece--Margaret's instructions on which direction to stitch initially confused me until I finally figured out she uses the economic method instead of the "wrap" method for the bargello like stitches--duh (hand hitting head--LOL). This makes for half stitches on the back, but does save a lot of thread. 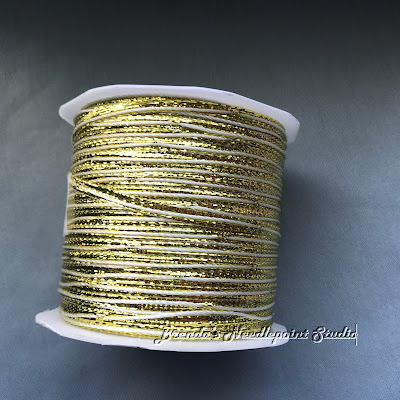 A good thing considering how expensive the silk threads are. I recenty found a You Tube video of Margaret talking about rozashi and showcasing many of her beautiful projects. Saw two or three I'd like to tackle. Here's the completed Rozashi East Meets West Ornament.